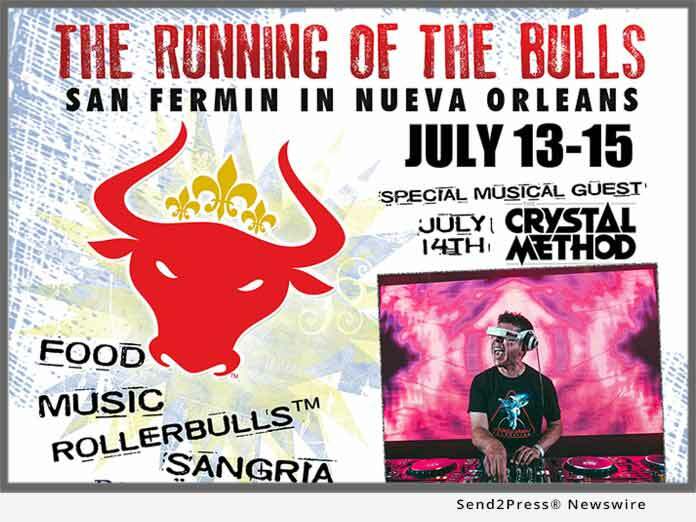 NEW ORLEANS, La., Jul 02, 2018 (SEND2PRESS NEWSWIRE) — Nola Bulls, LLC steps up to the big leagues for the 12th edition of the ever-growing San Fermin in Nueva Orleans (SFNO) presented by The Advocate, a.k.a. The Running of the Bulls in New Orleans. Los Pastores of Nola Bulls took a step forward booking a major music act, so 2018 promises to be an amazing year of music, food, drinks and what lovers of New Orleans like to do: Laissez les bons temps rouler. Back in 2007 some friends dreamt up the idea of recreating the famous Running of the Bulls in Pamplona, Spain by replacing the four-legged bovines with two-legged RollerBulls(TM) played by the Big Easy Rollergirls roller derby team. What has occurred since is nothing short of amazing. Each year hundreds of roller derby skaters (aka RollerBulls(TM)) from around the globe chase down and whoop willing runners through the streets of New Orleans. It’s all part of a great three-day fiesta. Friday July 13 at The Sugar Mill (1021 Convention Center Blvd) charity partners from Beth’s Friends Forever (BFF) host El Txupinazo (choo-pee-NAHT-so). The proceeds from the ticketed event and the live auction go to BFF, an organization dedicated to assisting women with cancer. The ticket includes food, open bar and live music and flamenco dancers from Ven Pa’Ca. This year’s restaurants include Atchafalaya, Bacchanal, Commander’s Palace, Sobou and Tavolino Pizza & Lounge. The grand prize, live auction winner will take home a Lifetime VIP pass to San Fermin in Nueva Orleans! Saturday’s July 14 festivities start early and go into the afternoon! Doors open at 6:30 a.m. at The Sugar Mill for some early imbibing or stretching. A drum and trumpet led procession and the always anticipated invocation by the Reverend Psych Ward precede the 8 a.m. sharp release of hundreds of roller derby ladies with horned helmets armed with plastic bats onto the streets where the real fun begins. This has been called (by us) The Greatest Show on Skates. Upon return to the Post Encierro registered participants will drink with their tormentors while enjoying DJ Otto followed by headliner The Crystal Method! VIP attendees enjoy food from The Halal Guys while others can purchase food from some great local food trucks. Nola Bulls famous sangria, beer, wine and lots of other refreshments are available throughout the festival site. Head over to La Fiesta de Pantalones right after The Crystal Method wraps. The Rusty Nail (1100 Constance St.) once again hosts that after-party with DJs and drink specials for registered guests of SFNO! Sunday July 15 is the finale, not just of San Fermin in Nueva Orleans 2018, but the World Cup. Doors open at 9 a.m. at Lula Restaurant Distillery (1532 St. Charles Ave) for the 10 a.m. game start. Immediately following is El Pobre de Mí. Brunch and absinthe drinks are available for purchase and guests are treated to an Ernest Hemingway themed burlesque show by Roxie La Rouge’s Big Deal Burlesque. A Hemingway lookalike contest ends the show and the year for Nola Bulls. Book your room at one of the festival’s sponsor properties from The New Orleans Hotel Collection by visiting http://www.nolabulls.com/hotels. Be sure to tell them you are coming for SFNO! Nola Bulls, LLC was founded in 2007 and is a provider and promoter of entertainment and cultural events in the New Orleans Area: Improving New Orleans one festival at a time. SFNO helps raise money for two local charities, visit http://www.bethsfriendsforever.org and http://bigeasyanimalrescue.org/ for info on these.